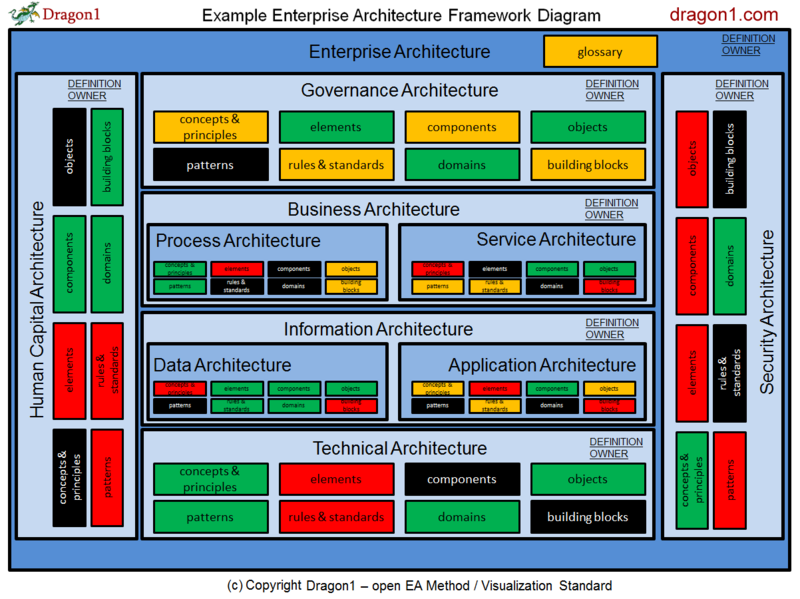 The Dragon1 open EA method defines a reference model for an architecture framework. In this context an architecture framework is the coherent set of architectures for an organization or collection of organizations. With this diagram you can make clear which architectures in your organization are recognized and managed. And even more: you can make clear what the most important parts of each architecture are that you recognize and manage. Dragon1 promotes that you create your own version of this visualization and make it part of your architecture dossier. Be sure to define owners and architects per architectures and agree on a definition for an architecture type for your organization. Do this also for all the parts of an architecture. The visualization below shows the most common and defined architectures in Dragon1 for any organization. It is common to create two of three versions of this diagram: the AS-IS, TO-BE and Envision version. Or current state, future state and envision state. In the current state, for instance, you may not actively be busy with a business architecture, whilst in the future state you are. With different versions of the EA Framework diagram, you can make this perfectly clear. Use colors like green, orange and red to indicate whether or not an architecture or parts of an architecture are recognized or managed.